Saturday, April 6, 2019, likely will be the best chance to see the 'Phillyhenge' sunset over Market Street in Center City Philadelphia. 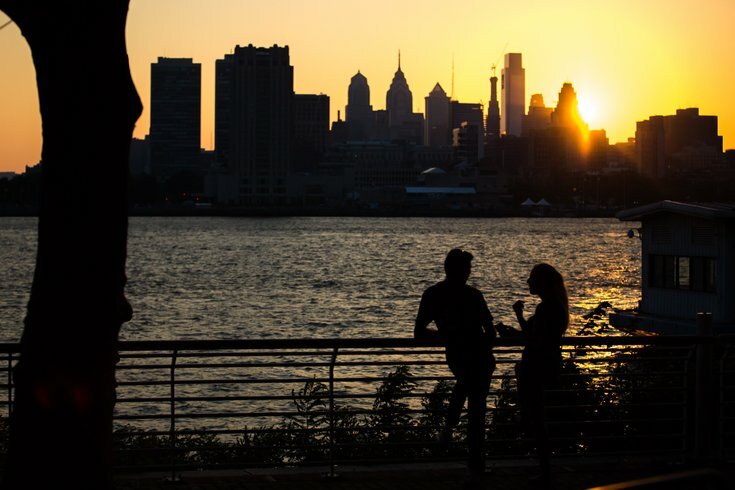 The biannual event occurs when the sun's position in the sky lines up with West Market Street, bathing the street and Philadelphia City Hall in a golden glow as it sets. There is perhaps no time of our adult life more fraught with fears and apprehension than when we finally make the decision to get healthier. There’s the fear of failure – the concern that we lack willpower and won’t be able to stick with a sensible dietary regimen and a committed workout schedule. Alongside that comes the fear of judgment – the self-conscious thought that others at the gym might snicker at our inability to do a push-up or assume a yoga pose. Then there’s the fear of injury – the not-unreasonable notion that throwing an out-of-shape body into a demanding workout routine might result in a pulled muscle or a turned ankle. There’s even a very real phenomenon known as fear of success, rooted in the anxiety that we may experience thinking about the strange and unfamiliar new lifestyle we’ll create for ourselves when we finally get thinner, fitter, healthier, happier. The fact is, fears are normal, hard-wired human emotions. They only become damaging when we allow them to paralyze us, or when they turn into excuses not to take action or to embrace positive change. That’s when fears become all-encompassing and inhibiting, and prevent us from enjoying our lives to their fullest potential. You’ve heard it a hundred times, but it’s true – they just don’t work long-term. Adopt a sensible, balanced eating plan, and don’t consider it a “diet” – consider it “your new style of eating – period.” This is one of the best ways to overcome the fear of weight-loss failure and backsliding. Support in the form of friends, colleagues, family members, and partners is a proven fear-buster. Whether it’s a morning power-walking buddy or deciding to take group-fitness classes at the gym rather than working out solo, there really is strength in numbers, and moral support is everything. Even the fastest member of your spinning class once climbed on that bike for the first time him- or herself. Keep reminding yourself that you’re not the only “fitness newbie” the world has seen, and you won’t be the last. If you’re using fear to avoid getting healthier, what is it you’re avoiding, exactly? What imaginary guarantee are you holding out for? Are you manipulating yourself with self-pity? And what is it that you are you afraid of losing if you succeed? Whether it’s with food or exercise, you’ll occasionally take two steps forward and one-step back on the road to better health. Expect it; don’t beat yourself up about it; and learn from it. It’s not failure, it’s feedback! At the gym, the dance studio, or on the yoga mat, blend in, and take cues from the instructor and from other class members. Realize that everyone is way too focused on his or her own fitness to be judging or looking at you. If you’re really intimidated, workouts are a bit easier if you avoid peak hours and go to the gym at “off” times during the day rather when the gym is crowded (i.e., early morning and right after work). Adopt a positive, confident attitude when visiting the gym, even if you’re just “acting as if.” Self-assurance can become a habit. Just tolerating an exercise routine or a sport is not enough. If you can find something you really love to do – tennis, swimming, modern dance, weight-training, whatever – and you’re far more likely to stick with it. Simple enjoyment and having fun are by far the best motivators. Bottom line? Fear can be a crippling obstacle to achieving a healthier lifestyle included. Don’t let it!